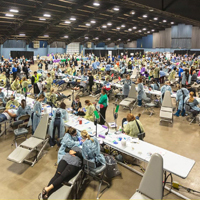 The 10th annual Oklahoma Mission of Mercy (OkMOM) took place at State Fair Park in Oklahoma City on February 1-2, 2019 and Delta Dental of Oklahoma showed up in a big way. This two-day free dental clinic offers care to patients who are either uninsured, under-insured or simply do not have access to care. In 2019, 1,684 patients were treated at the Oklahoma Mission of Mercy, totaling $1,512,266 in donated dental care. The event was a success with the help of 1,970 volunteers from across the state – including more than 80 Delta Dental of Oklahoma employees. Delta Dental of Oklahoma and its Foundation provided $150,000 in grants and more than $50,000 in in-kind donations to the event. Delta Dental of Oklahoma’s support of the event included commissioning local artist and muralist Kristopher Kanaly to create a special piece to commemorate a decade of the Oklahoma Mission of Mercy events, entitled Celebrate Oklahoma Smiles. See a behind the scenes video of Kanaly’s creation here. Kanaly was inducted into the Google Cultural Institute for his public art contributions to the state of Oklahoma in 2015 and also founded the Oklahoma Mural Syndicate in 2017, a nonproﬁt dedicated to advocating, curating and funding public art. Hear testimonials from several OkMOM patients and anecdotes from volunteers and John Gladden, president and CEO of Delta Dental of Oklahoma. Since 2010, OkMOM has treated 16,138 patients, totaling more than $12 million in donated dental care. OKMOM is co-produced by the Oklahoma Dental Association, the Oklahoma Dental Foundation and primarily funded by the Delta Dental of Oklahoma Foundation. OkMOM’s 11th annual event will be held in Stillwater, February 7-8.